Hey there! We all know that you guys enjoy the membership benefits such as discount to our sponsors and events. Well, as the title reads, WE HAVE A NEW SPONSOR!. 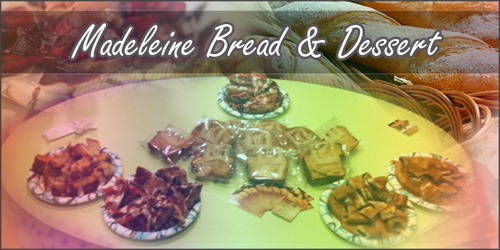 Madeleine Bread & Dessert has many delcious, mouth-watering pastries waiting for you to buy. Many of you university students are always on the go and don’t have time to make breakfast. Well Madeleine is the perfect spot for a quick breakfast! And if you’re not there for breakfast, they have delicious desserts! Many of you went to dessert night and enjoyed the wonderful desserts provided by your officers. Along with those desserts there were some breads and waffles prior to and during jeopardy. Those were provided by our sponsors, wern’t they scrumptious? They’ve recently decided to sponsor us and we are honored! We are still finalizing details on what the benefits will be so keep checking our website for updates!